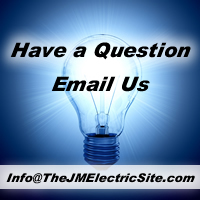 JM Electric Inc. is a fully Licensed Electrical Contractor servicing Oakland, Macomb, St. Clair County of Michigan. Our experienced electricians specialize in all types of wiring for Commercial, Industrial and Residential. 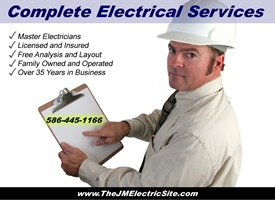 JM Electric Inc. offers a wide variety of electrical contracting services located in Roseville Michigan. From a service call to wiring a 100,000 square-foot commercial establishment; no job is too small or too large. Servicing the Macomb, St. Clair and Oakland County area, we have highly qualified electricians for all types of jobs. We are dedicated to providing state of the art electrical design, installation and repairs in an ever-changing marketplace. Our experienced electricians specialize in all types of wiring for Commercial, Industrial and Residential. With over 35 years in business JM Electric, Inc. has been committed to delivering solid expertise and highly skilled workmanship as well as top notch service to hundreds of customers. As a family owned and operated company, we truly understand and respect your property and your time. Realizing that the best advertisement is a happy customer, we make sure that you get a quick response from one of our well-stocked service vans. By utilizing the latest in energy saving technology and co-generation systems, we can design and install high efficiency equipment that reduces operating costs and increases reliability and life span of all of your electrical equipment. With needing to conserve in these times, making your home or business energy efficient is a means to cut your costs. JM Electric can perform a energy audit. We at JM Electric Inc guarantee you will be satisfied with our personnel and workmanship. Our friendly and professional electriciansl are professionally trained and certified. We guarantee quality service at an affordable price. Throughout the years we have earned our reputation by delivering fast, high quality work at reasonable rates. You can count on our expert electricians to be knowledgeable, reliable and capable. They will make sure that you’re happy with our work no matter how large or small the job. You can expect fast FREE estimates, competitive pricing and quick response on all our jobs. Our Electricians service Oakland, Macomb, Wayne St. Clair Shores Michigan. With needing to conserve in these times JM Electric can replace old energy drawing systems to more energy Efficient.